We’ve put together an exciting list of 27 TOP things to do in Bergen, just for you. Bergen was once the capital of Norway. This beautiful city is a mix of old and new, calm and crazy. There are so many cool activities to do in Bergen that will surely satisfy every type of traveller; from families to couples and solo-travellers. Whether you’re after the must-do tourist scene or local insider tips; we’ve got you covered. Oh! We’ve even included our top hostel recommendation in the city; our 5 Star Hostel Marken Gjestehus. Scroll down to find out where to stay in Bergen. Are you on a short stay in Bergen? Find all main tours and activities here. The colourful buildings at Bryggen are a must see. Dating back to 1702, Bryggen is a UNESCO Wolrd cultural Heritage site. 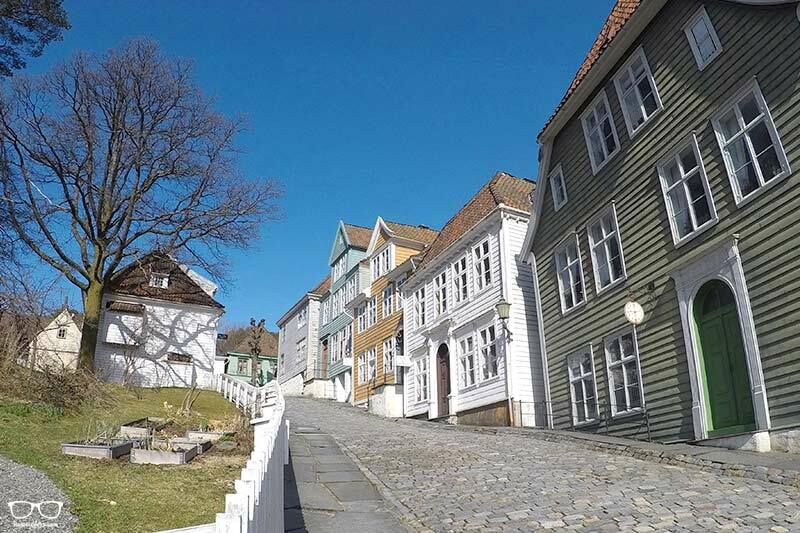 It’s the place to grab postcard-perfect pictures of Bergen’s wooden structures. One of those places where you can get many beautiful photos for your Instagram. Looking for that perfect traditional Norwegian woollen sweater? After you’re done with souvenir shopping, be sure to explore the alleyways. Finish off with a bite to eat at Bryggen Tracteursted. Traditional food in a traditional building – how cool is that? Here you’ll discover more about the history of the area. What a fantastic view from Fløien, a must visit spot in Bergen. 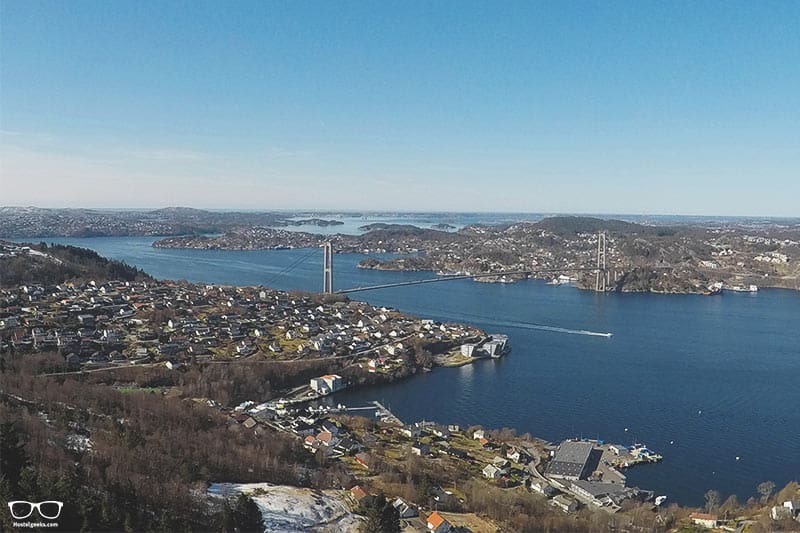 Are you keen to see the stunning view over Bergen city and beyond? That is why a trip to Fløyen is one of our must see in Bergen. Bring some water for the trip with you and pack your camera plus your trekking shoes. There is plenty of nature to discover and to go hiking at the following recommendation. Two options: hike up or take the Fløybanen – an 850 metre-long electric cable funicular – both are fun! From the top, there are numerous walks. The official Fløybanen website offers some great suggestions for all the family. The funicular runs all year round from early morning to late at night. In the winter you can buy a special sledging pass! Check out the Fløien Folkerestaurant, cafe and shop at the top. If Fløyen doesn’t sound strenuous enough for you, never fear! There is plenty of things to do near Bergen Norway. The city is known as the ‘city between the seven mountains’. What cooler way to spend your time than hiking all seven? Plus three of the following: Lyderhorn, Sandviksfjellet, Blåmanen, Rundemannen and Askøyfjellet. Cool fact: locals still argue which mountains are the official seven because many of them belong to the same massif! The seven mountains walk is 30km long and has a total elevation of 2200 metres! There is an official day hike each summer and anyone with a good fitness level is welcome to join. Check the official day hike here. Top tip: Put safety first if you decide to head out on this adventure unguided. Know your limits and check out this great safety information from Visit Norway. 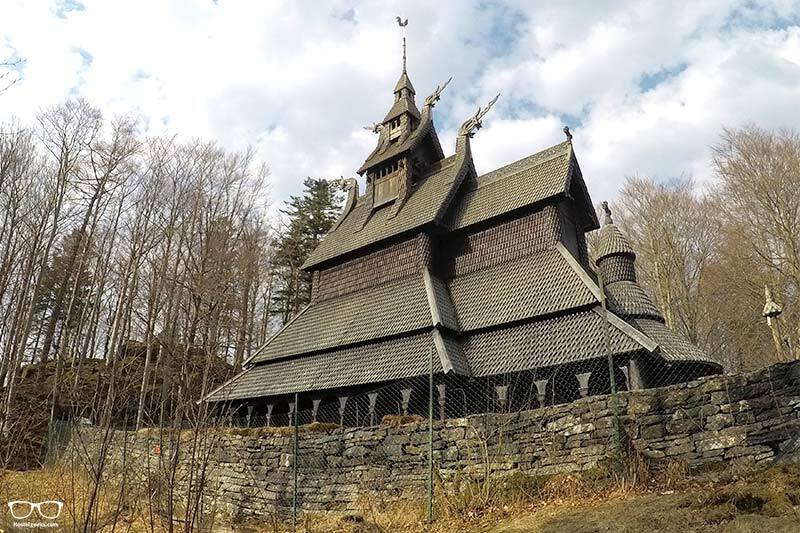 Most of the remaining stave churches are found in Norway. This is why it makes the list of top Bergen things to do! This particular church originally dates back to 1150. Though it was rebuilt after an arson attack in 1992. Find out opening times and entry prices for Fanthoft here. #5 on our list of what to do in Bergen is the world famous Fjords. For those that have a bit more time and money – a day (or two) tour to the nearby fjords is perfect. You will find this one on many lists, even on the Bergen Tripadvisor things to do. Many companies compete to provide you with the best tour and they are available all year round. The Norway in a Nutshell Tour is the most popular. Why? 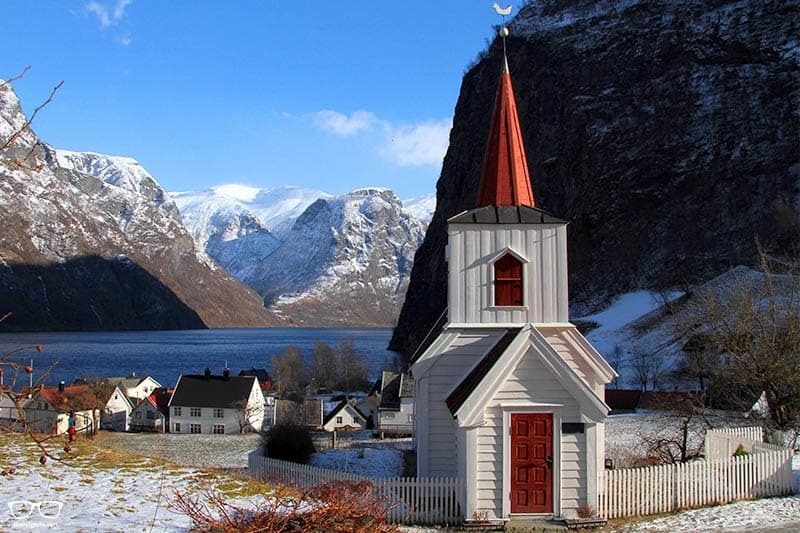 and visit the stunning areas of Flåm and Gudvangen. We recommend popping into the Tourist Information in the city centre to ask about available tours. It would be rude not to take a dip in the outdoor heated pool of Bergen! Next to the pool, there is a roped off area in the ocean. It might be best just to jump in before you test the water temperature with your toe. Just saying. But shh, it’s our little secret! It’s nicely tucked away from the tourist crowds. 7. Escape – with your friends! No, we are not talking about escape from Bergen… there are still plenty of things to do on our list, but what about an Escape room?! That’s right: Bergen has not just one, but two escape rooms. This is a fun activity for couples, friends, families and groups. Heck, even solo travellers can enjoy – there’s no doubt you’ll meet people at our 5 Star Hostel – Marken Gjestehus – to join forces with. What’s the objective in a escape room? You have 60 minutes to escape from the locked room using logic, creativity and teamwork. Escape Bryggen is located in one of the wooden buildings in Bryggen. Here there are 4 themes on offer including a creepy hotel room. Escape the Room has two different rooms. Find yourself trapped in a wizards working room, or trying to escape from the local sheriff. The lovely owner of this awesome idea – Benedikte – is kicking off the vegan scene in Bergen with a bang. The three-wheeled cafe can be found at many popular events during the year. If you fancy a guilt-free, healthy and home-made meal, have a gander at the Vegan Pop Up Cafe website and see where it can be found. The Cafe is strictly a no plastic zone. Instead, bamboo straws, corn flour cups, paper and wood are used. Try something different; be good to your body, save the planet and the animals. 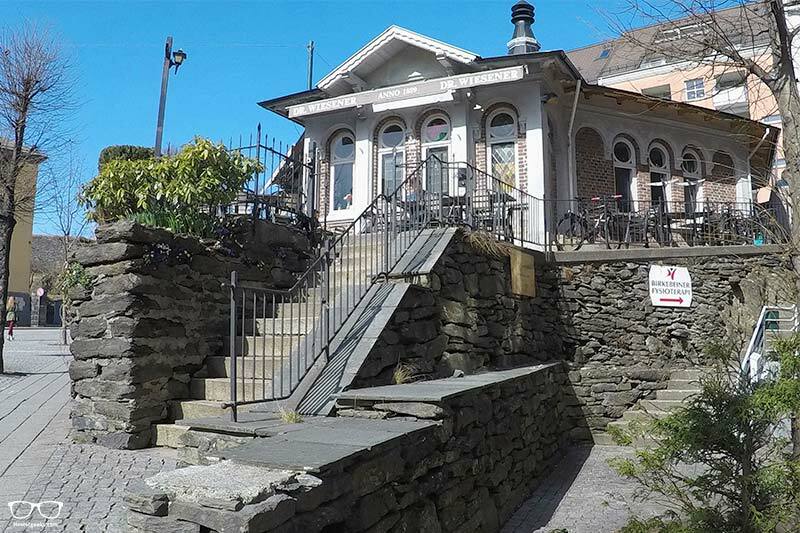 Believe it or not, it is possible in Bergen, or should we say Gamle Bergen. The old Bergen was once Europe’s biggest wooden city! There is an open-air museum nearby the city centre. 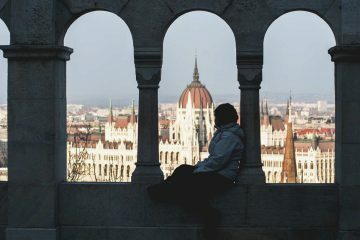 Here you can peek in windows of buildings from the 18th, 19th and 20th century. The museum’s role players really bring it to life! Ask them questions and admire their traditional clothes. Top tip: take a packed lunch and enjoy it in the surrounding park (it’s one of the best free stuff to do in Bergen). Remember: Take some extra bread for the ducks! In case you didn’t know, Edvard Grieg was born in Bergen. He is considered to be the leading romantic era’s composers. Not entirely sure of who we’re talking about? Type in ‘In the Hall of the Mountain King’ and you’ll soon find yourself saying “oh yeah, I know this!” – It’s guaranteed. Edvard and his wife lived in what is now known as the Troldhaugen museum for 22 summers. Here you can visit the house, the composer’s hut and the gravesite of the couple’s tombs. It’s open all year round too! Find out more information on ticket prices and opening times here. For the music lovers out there with more time on their hands – this one’s for you! 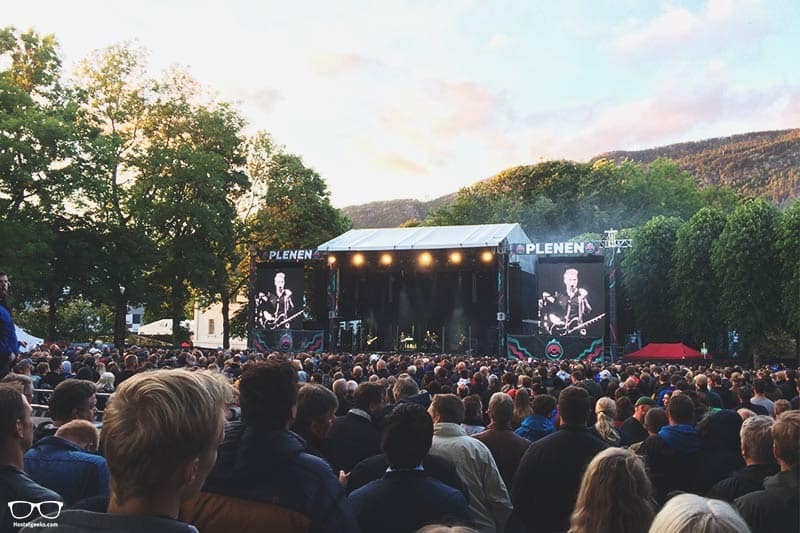 Bergen Fest is a yearly 5-day music festival in the heart of the city. 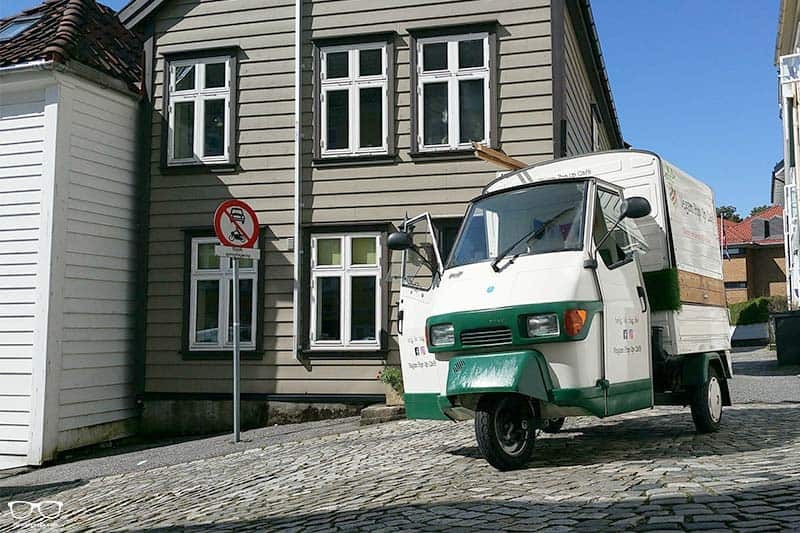 It is no doubt one of the unique things to do in Bergen. Big name artists such as George Ezra, Queens of the Stone Age, James Bay and Liam Gallagher have been a part of it. This is also the perfect chance to experience Norwegian music… in Norway! Both day tickets and festival passes are available. So even if you’re only around for one of the days, you can still enjoy the show. Check the Bergen Fest dates and details here. If you explore the surrounding mountains and nature areas of Bergen, you’re sure to come across an old World War One bunker. Many have been left in their original state. Some are now home to picnic benches that show off the stunning views. Psst! If you continue reading further down, we’ll let you into a little secret. A Bergen local has provided details on how to reach some bunkers away from the tourist hustle and bustle. 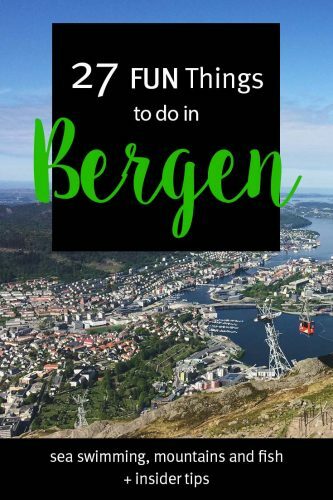 You’ll find details at number 27 of our to-do list for Bergen Norway. Every country has a festival worth attending, and Norway is no exception. It may not be simple to ensure you’re in Bergen for 17th May, but we highly suggest you consider it! 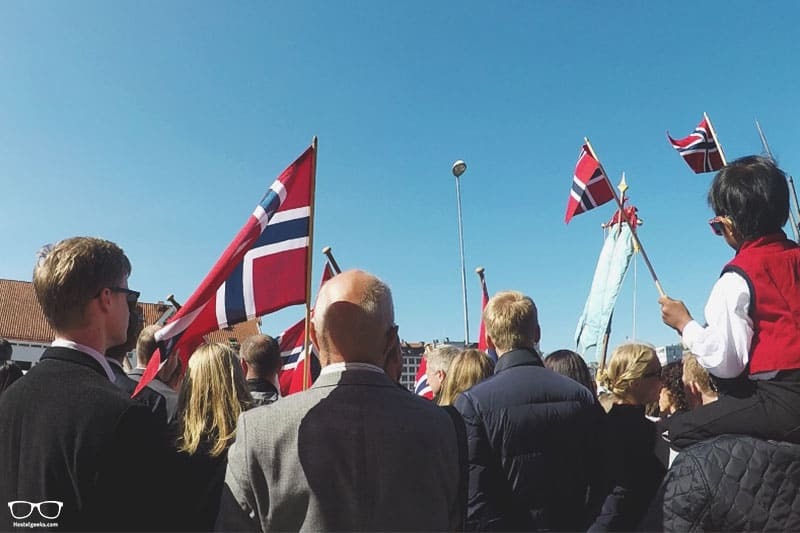 17th May in Norway could be compared to the Rio de Janeiro of Brazil – Norwegian style! Drinks, laughter and plenty of patriotism! What is one of the most common things to do in Bergen at night? Try to see the Aurora Borealis. Known as Northern Lights. In Bergen between winter and spring? Check. One other thing: be sure to download My Aurora Forecast app. Check in a few hours before the sun goes down and see the predictions. There is also a Facebook page that’s good to keep an eye on. A few of the members are pro at predicting where and when the lights may be visible! 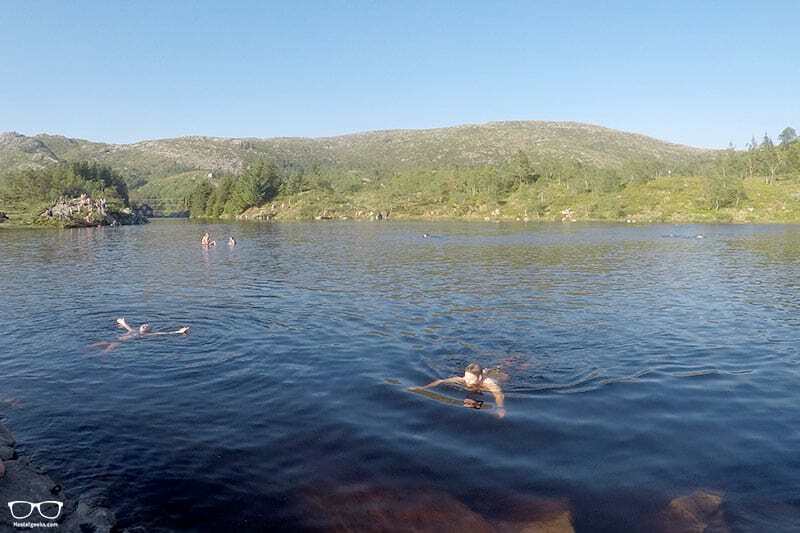 Top tips: Head down to the water or into the hills and face north towards the horizon. It may not be possible to always see the lights with the naked eye. Set your camera up and shoot towards dark grey patches in the sky. 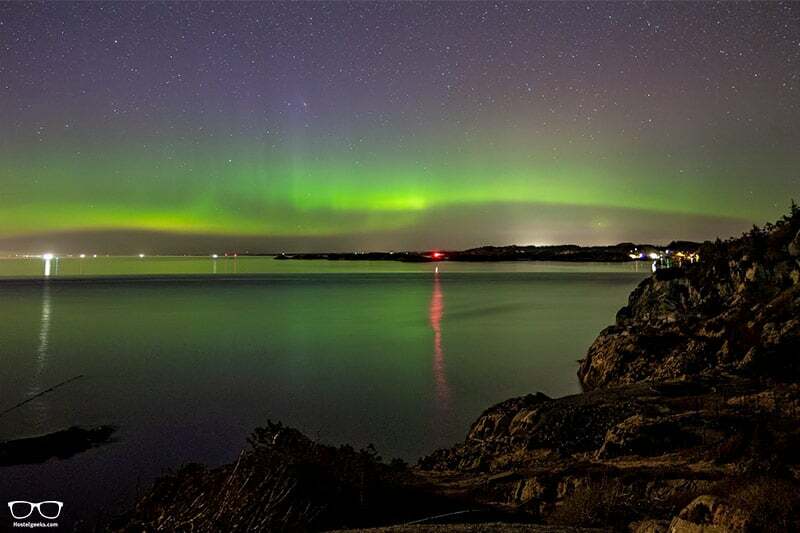 From now on, whenever you wonder what is there to do in Bergen Norway, you now know it: Admire the Northern Lights! St George’s hospital for lepers, in Bergen. This was once one of three hospitals for the largest concentration of leprosy patients in Europe. The present-day buildings date back to the 18th century! If you buy one full-price ticket here, you can enjoy 50% off at all other museums in the city. It’s always good to have a rainy day back-up. Here is a link to all the museums of Bergen. This is no doubt one of the coolest things to do in summer is explore it by bike. Especially when visiting Bergen in June, July and August, biking the area is one of our favorite things to do around. It allows so much freedom! Avoid running for the bus and spend those extra pennies on a postcard or two. By far the coolest bicycle rental is with Bysykkel. Each summer around 400 bicycles are deployed around the city. eave it at another station of your choice. Bergen Base Camp offer a package deal – bike, helmet, lock and offline app with suggested routes around the city. Mountain biking is also available at the top of Fløyen. 17. Go to the beach! A beach in Bergen? Well, not quite. For the travellers with a rental car, we have a great idea for you. The island of Askøy can be seen from the dock in Bergen. At the tip of this 39 sq km island lays another island named Herdla. This is even smaller at only 0.62 sq km! Herdla is home to a nature reserve with 220 registered bird species. More importantly, there is a beach! Perhaps you’re brave enough to take a tip in the open ocean. Perhaps you’d be happy to wander along the coastline. Directions: drive across the Askøy Bridge and follow the main road all the way to the end. It’s around a 40-minute drive from the city centre. Simple! Gunnar Staalesen, a well-known Norwegian author, was born in Bergen. Can you guess where his popular crime novels about a private detective named Varg Veum are set? So we have two suggestions for you. Grab a Staalesen novel for the journey to Bergen, and then join a walking tour and bring the story to life. Grab your dancing shoes and head to Vaskeriet, the silent disco. How fun would it be to report home and say one of the top activities is to experience a silent disco? It’s every Wednesday and Thursday throughout the season. I guess it’s up to you to attend and find out why it’s so popular! The stunning Statsraad Lehmkuhl sailing ship was built in Germany in 1914. However, her home port is Bergen. Although she travels the world, she often visits Bergen and shows off down by the dock in Bryggen. There is a Tall Ships Race each year and it is set to hit Bergen again in 2019. If you’re lucky enough to be in the city at the same time as Statsraad Lehmkuhl be sure to climb aboard and marvel at her beauty. This particular pub is a mix of interesting history, good vibes, awesome design, friendly staff and a wonderful selection of food and drinks. Basically, it ticks so many of the Hostelgeek boxes that it’s just short of somewhere to sleep! Awesome fact: This pub used to be a community bath house! Established by Doctor Joachim Wiesener, the aim was to provide affordable public baths for people with low incomes. But get close and personal with Edvard Munch. Most likely you’re familiar with Edvard Munch’s most famous work ‘The Scream’. hosting one of the largest collections of Munch paintings in the world! The exhibition can be admired at Kode 3. This is one of four Kode Museums within the city. The largest park in Bergen is suitable for every kind of traveller. It’s the perfect place to take a stroll, sunbathe and entertain the family. The park’s design is of an English style landscape. At the north end, there is a large lake and outdoor play areas for kids. There are ongoing improvements with the future opening of a music and theatre pavilion. 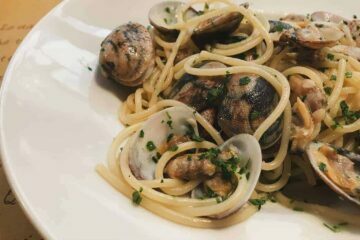 Forget the Fish Market – dine at Cornelius. Take it from us: the fish market in Bergen has lost its charm. It has become over-priced, hectic and charmless. But never fear, Cornelius is here! One of Norway’s best seafood restaurants is right by the sea on a small island, 25 minutes from Bergen. The only way of reaching it is by boat. Super cool, right? It’s open all year round, too. It is possible to book the “Seafood experience with a boat trip and lunch/dinner” online. One of the oldest and best persevered stone fortifications in Norway is the Bergenhus Fortress. – what more do we need to say? The fortress is right next to the famous Bryggen and entrance is free. There is also an attached museum with detailed information about the history of the area. The city’s history is rich and discovering it first hand is definitely one of the FREE things to do in Bergen. Dotted all around the city there is incredible street art. Some of them are signed by the artist, whilst others are unknown. 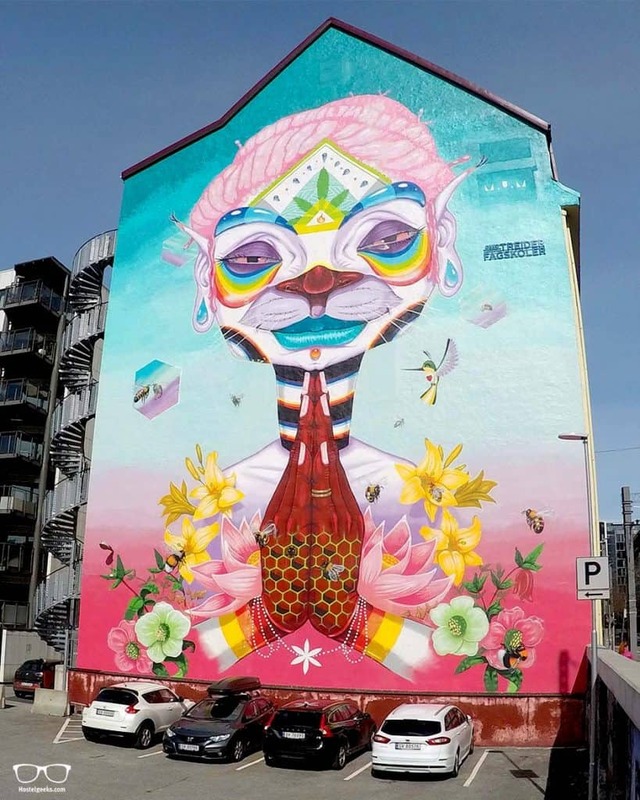 Check out this wonderful Street Art Bergen blog that provides locations and artist details. What a perfect way to explore the city. And finally! This last suggestion was given to us by a local. Earlier we promised you a beautiful destination. It’s not far from Bergen centre, but away from tourist hot spots. 27. Swim wild at Helleneset! Or Cook outside. And Discover WW2 bunkers. Just off the main road, 25 minutes from the centre, there is a hidden gem: Helleneset. steps leading down into the sea. sunbathing, reading, napping – you name it! It’s suited to everyone, that’s for sure. Take bus 5 or 6 heading north of the city towards Åsane terminal. After around 25 minutes get off at Hellebakken bus stop. Take the first left in front of you pointing to Helleneset. Follow the road down the hill until you reach the water – you can’t miss it! From here it is just a short walk to the old WW2 bunkers. Retrace your steps to the bus stop and continue walking until you reach the Spa supermarket. Behind the shop, you’ll see a path hugging the cliffs to the left – follow this. Keep left towards the top and the path will lead you straight to a bunker! Did you know you can also go kayaking during summer in the area of Bergen? Bergen Base Camp arranges these kayaking tours. Kayak paddling gives you a special vicinity to the water and the nature surrounding it. This will provide for a great experience in the Norwegian Fjords. The kayaks are stable and safe, and the guides have the best knowledge and experience to ensure the best experience for you. 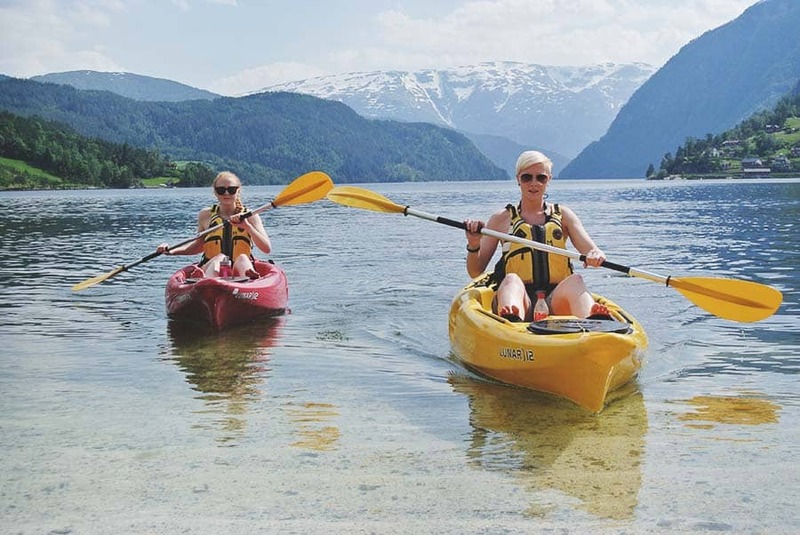 The Bergen Base Camp offers Kayak tours in the city fjord of Bergen, Hardangerfjord, Nærøyfjord and more fjords which offer special nature experiences in Fjord Norway. We love Bergen for its beautiful nature and excellent hiking opportunities in its immediate surroundings. And if you need a cool fun bar out, and a tasty restaurant to try Norwegian cuisine, we will show you where you can do so in Bergen! In this list we did not just focus on 10 best things to do in Bergen Norway, but a bunch of more local and fun stuff besides the points of interest. 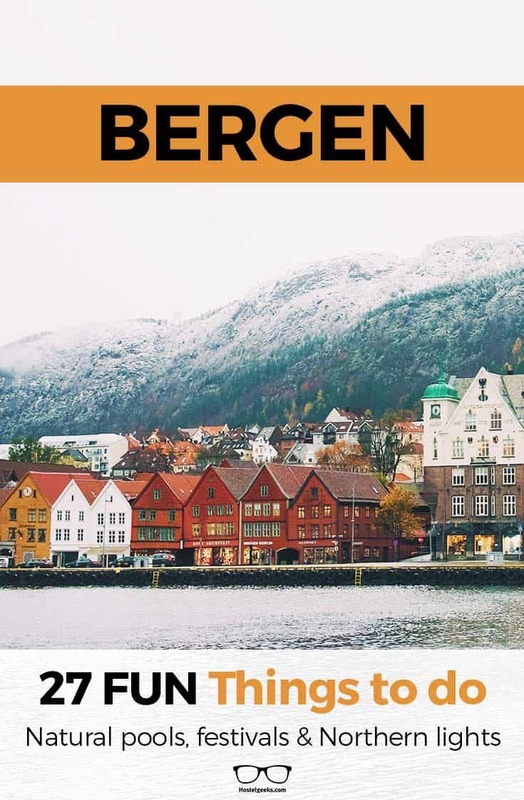 We share with you those tips for Bergen. Small and cozy! Sit down at the indoor terrace, and get a coffee, and a sandwich for a local price. Super delicious Norwegian cooking in a cute restaurant. We are big fans of Pingvinen. The lovely service and the yummy Norwegian beer taps will make you fall in love with this hidden gem. Best part: It’s less pricey for Norwegian standards. So, here you go. Now you know where to eat in Bergen on a budget. We menionted the Ulriken Mountain already, but we want to go into detail here. Slightly outside the city, just a short 5-min cable care ride further, you can discover purest nature. At the top of the mountain you will get another, even more impressive view of Bergen. We recommend getting here early in the morning – the light is usually perfect for great photos! Let’s end our fantastic day in Bergen with a beer or coffee at the record shop Apollon Platebar. They even organize events like small concerts by local bands. It cannot get any better! Cheers! Sometimes you’re limited for time but want to see as much as possible to get a feel for a place; we get that. Thankfully Bergen is easily accessible on foot and by bike, so that makes a 1 day exploration of the city pretty easy. So, what to see in Bergen in 1 day? There’s a few items on the list you must see in Bergen. 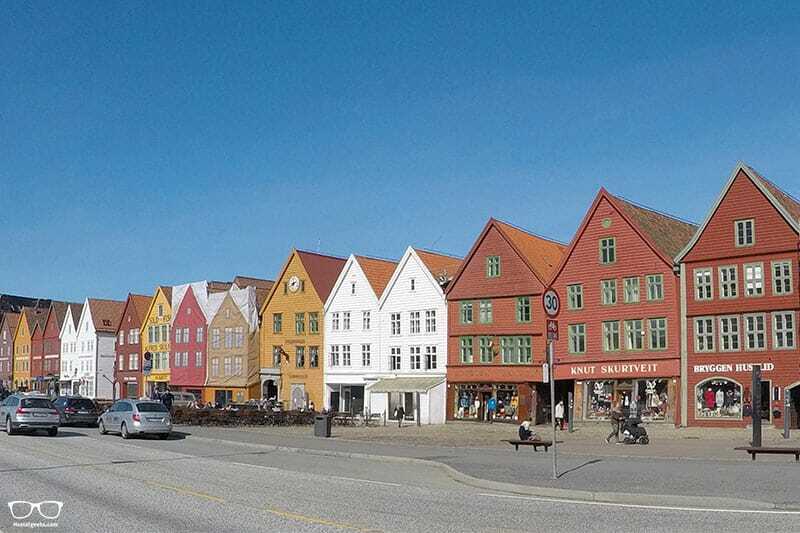 Grab a morning coffee and go for a stroll along the Bryggen front. Take some snaps as the morning sun lights up the brightly painted buildings. Buy a souvenir or two now and get it out of the way. Before the crowds come pouring in, take the funicular to the top of Fløyen and explore the beautiful surroundings and views from the platform. Tip: if you’re a keen walker ignore the next bit and spend the entire day in this area – the paths stretch for miles! Grab a bite to eat at the famous Fish Market not far from the bottom of the funicular. If you like shopping, wander around the city centre and have a look at St John’s Church. Alternatively if you’re feeling more energetic; hire a bicycle and flit between some of the museums surrounding Lille Lungegardsvannet. Head to Nordnes point to enjoy the sunset and take a dip in the sea if you’re feeling brave! There’s usually tons of entertainment in the city (season dependant). Ask the staff at your accommodation and enjoy a night on the tiles. We highly recommend a healthy, tasty meal at the friendly Dwell Restaurant first. I hate to burst your bubble, but there are no Bergen Fjords. At least, you certainly won’t be strolling around the city only to find yourself staring up at a beautiful waterfall! However! It is possible to take a day tour and visit the nearby Fjords by cruise. There are many companies offering different options. Have a look at these Bergen Day Trips to get an idea of what is possible. Are you set to brave Norway in the winter? Great! 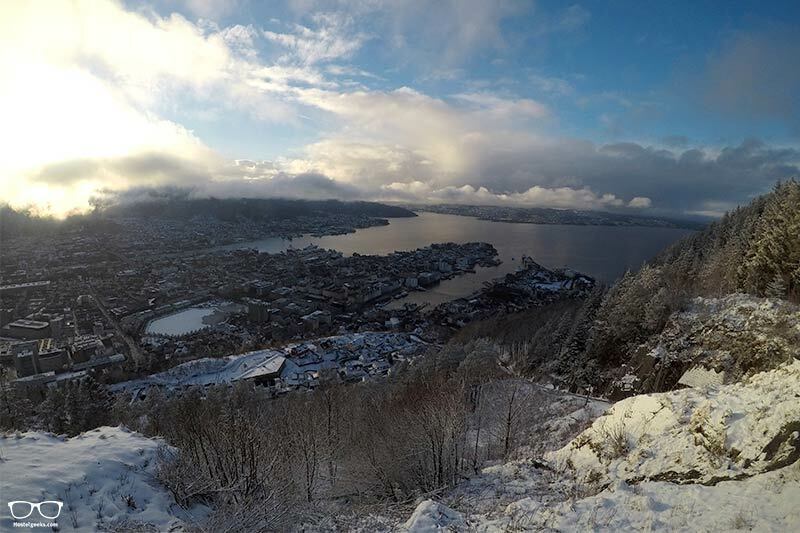 Bergen becomes even more beautiful during the white months from November, December, January, February and March. Keep in mind, every year is different. So the colder months can stretch from November to April too. From August until June, Bergen Philharmonic Orchestra has concerts at Greighallen every week. There are 100 musicians, so definitely worth seeing when you’ve had enough of the snow! You made it this far – great! Didn’t we tell you Bergen is full of awesome things to do?! We’ve put together this handy map for you so that you can familiarise yourself with where all of the top activities to do are located. Have fun exploring beautiful Bergen. The centre of Bergen is so small, it may have you questioning whether it is actually a city. 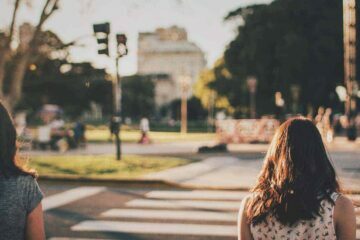 One good thing about this is that all of the main sights, shopping areas and good restaurants are all within walking distance. In fact, we have a lovely 35€ discount for Airbnb that you can use. Bear in mind that Norway isn’t the cheapest of travelling destinations, so we suggest booking your stay at a hostel if you’re a bit more money conscious. In case you didn’t know, we have our very own 5 Star Hostel in Bergen, Marken Gjestehus. 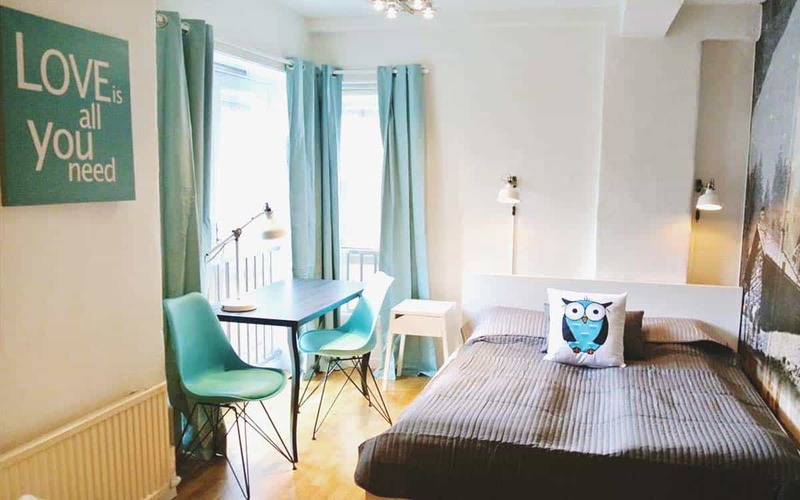 This stylish, cosy and centrally located 5 Star Hostel is not to be missed. 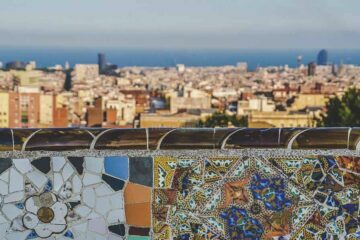 We wrote a guide on how to book hostels with Hostelworld. Of course there is many many more things. By no means is this the full list. Yet, not to worry. We will keep this list updated and always fresh. You can find all tours and activities here. Let’ s just say; the more time you have for this Norwegian city, the better! Any questions? Please please bother us and leave a comment. 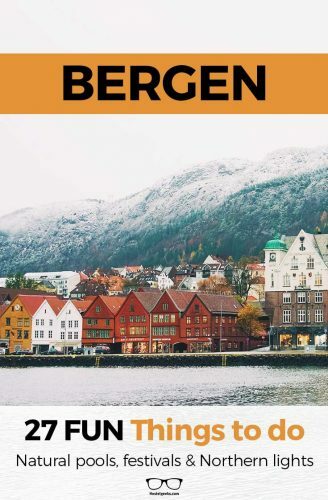 Your comment helps us to improve this Bergen guide. Perhaps you have something to add? Maybe something isn’t quite right? We’d love to extend this list and make sure it’s spot on! 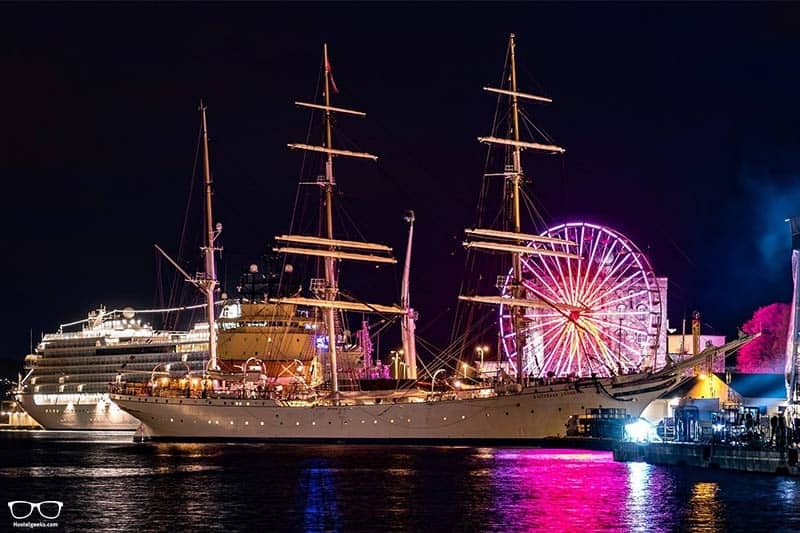 Credit: Thank you to Steve Harrison Snoots for the photographs of Statsgaard Lehmkuhl and Aurora Borealis. Find more of his work at SHS Photography. Norway is the best place according to me. 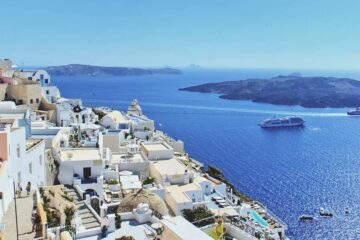 It has all the elements which makes a holiday A WOW experience. 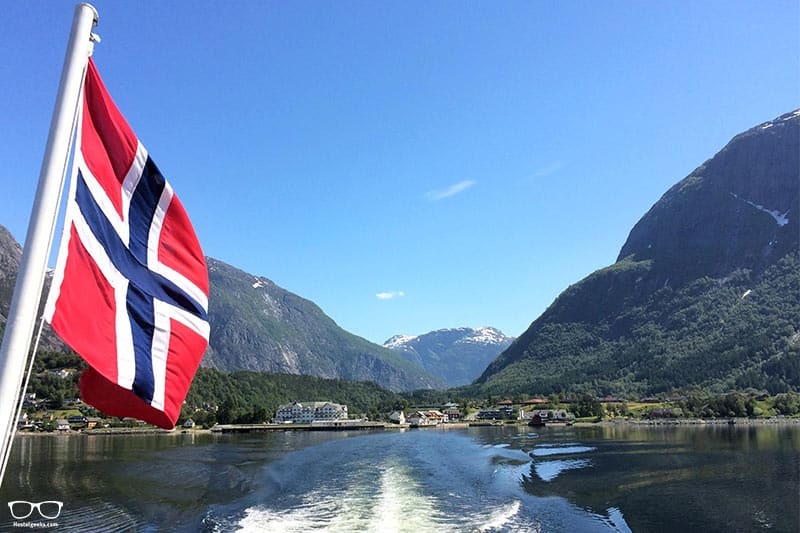 I love your statement about Norway – it really does have the WOW factor! Have you been to Bergen? What did you like most about this city nestled between sea and mountains?